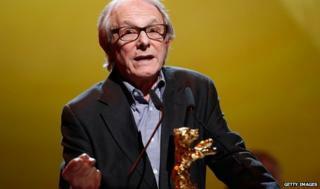 British director Ken Loach has addressed reports that his next film will be his last, as he received a lifetime achievement prize in Germany. "We'll have to see," said Loach, 77, noting that filmmaking requires "a physical stamina" that tails off "when you get into the wrong end of the 70s". All the same, he added, "it's not a privilege that you give up lightly". Loach won an Honorary Golden Bear at the Berlin Film Festival, recognising films such as Kes and Cathy Come Home. He was also celebrated with a gala screening of Raining Stones, a 1993 film about a poverty-stricken suburban family that Loach said was "still relevant" and, despite the subject, "quite a cheerful film". The director has spent a lifetime battling to make uncompromising films, often focusing on Britain and Ireland's overlooked underclasses. The Oxford University graduate began his film career in what was known as "kitchen-sink" realism. He came to prominence in 1966 with Cathy Come Home, a Jeremy Sandford television play about a family's slide into poverty and homelessness. Broadcast on the BBC, it sparked outrage at UK housing standards and led, indirectly, to the establishment of the housing charity Shelter. "It contributed to changing the law," Loach told his audience in Berlin, but added: "The grander the theme the less chance you have of an immediate response. It's more like contributing to a discussion and adding one small voice to the rest of the noise that is out there." Kes, released in 1969, was his first major feature film. The story of an abused teenager and his falcon, it remains one of the director's best-known works in the UK. Since then, he has made more than 30 films, and won the Palme d'Or at Cannes in 2006 for The Wind that Shakes the Barley, about Ireland's struggle for independence. It was his seventh entry for the festival's top film prize, but his first win. He previously won the jury prize in 1990 for Hidden Agenda, about a British army shoot-to-kill policy in Northern Ireland. Asked in Berlin about some of his more recent films, Loach said he had particularly enjoyed Looking for Eric, a 2009 movie about a postman who idolises Eric Cantona and receives "life coaching" from the French footballer. He said that he and his screenwriter Paul Laverty had deliberately given difficult dialogue to Cantona, who plays himself in the movie. One example was: "He who serves thistles shall reap prickles." "Try saying that if you speak French as your native language," Loach laughed. "It was a cruel trick on the great man but he came up smiling." Loach's next film is Jimmy's Hall, about James Gralton, the Irish communist leader who set up a dance hall in County Leitrim, which he used to disseminate his political views. His long-time producer, Rebecca O'Brien, told ScreenDaily last year that the movie would probably be his last. "This is probably the last narrative feature for Ken," O'Brien said. "It's such a huge operation and Ken doesn't sit in a director's chair, telling people what to do. He runs around. It requires a lot of physical and mental stamina." "Realistically, I'd be very surprised if we made another feature after this one." O'Brien continued: "There are a few documentary ideas kicking around, and that will probably be the way to go. "I think we should go out while we're on top." The Berlin Film Festival continues this weekend with the premiere of literary adaptation The 100 Year-Old Man who Climbed out of the Window and Disappeared; and a screening of the first two episodes of Netflix's political drama House Of Cards. It culminates with an awards ceremony on Sunday, where British actor George MacKay (Birdsong, Sunshine On Leith) will receive a Shooting Star Award. Last year, the festival's main prize was awarded to Romanian film Child's Pose.